"These are the cookies that my mom used to make every Christmas time." In a large bowl, cream together the shortening, white sugar and brown sugar until smooth. Beat in the eggs one at a time then stir in the vanilla. Combine the flour, baking soda and salt; blend into the creamed mixture. Roll dough into 1/2 inch balls and place them 1 inch apart onto the prepared cookie sheets. Flatten each ball slightly and sprinkle with colored sugar. 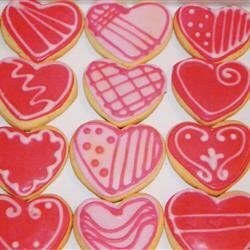 So easy to make, sugar cookies make perfect treats any time of year! Easy! Easy! EASY!!! Just remember to chill the dough in wax paper for about 45 minutes for "bakery cookie" results! THESE COOKIES ARE GREAT. I LOVE THIS RECIPE BECAUSE IT DOES NOT REQUIRE BUTTER. THE COOKIES CAME OUT VERY SOFT AND YUMMY! This took me all of about 10 minutes to prepare, and they tasted great.